Labour leader Jeremy Corbyn has revealed he is supporting the strikes on Southern Rail and Eurostar – despite the walkout causing travel chaos for hundreds of thousands of commuters. Members of the Rail, Maritime and Transport union at Southern Rail walked out in the morning of Monday, August 8 after talks aimed at resolving a dispute over the role of conductors collapsed. As a result its services were severely disrupted and the train firm announced it would introduce an emergency timetable and run just 60 per cent of its services across London and the South East. Meanwhile, Eurostar workers planned to strike for seven days in August in a dispute over their work-life balance. His comments were made during an extensive interview with the Observer and it comes after Southern Rail ran just half of its services on Thursday. He also added that he believed that Southern had ‘not fulfilled its obligations’ and referred to its passengers on the Brighton line as being ‘unbelievably angry’ about the situation. Mr Corbyn’s latest comments could frustrate voters living in the south who have been affected by the strikes. The 67 year old – who is going up against Owen Smith in the party leadership race – also added he was being ‘out-lefted’ by Conservative MPs who want Southern Rail to be handed over to the publicly-owned Direct Rail. 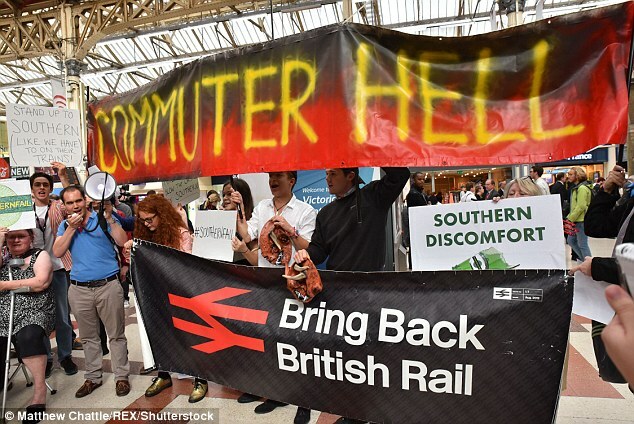 Earlier this month and speaking at a leadership campaign rally in Brighton, Mr Corbyn demanded that the Government renationalise the Southern Rail franchise to ease the suffering of thousands of commuters. He publicly condemned the private firm’s continued profits at a time it faces a battle with staff and unions. Strikes by Southern Rail workers on Thursday and Friday were called off but services were still be disrupted despite fresh talks over the role of conductors being put in place.